100% reclaimed or salvaged wood that has a history - a story. 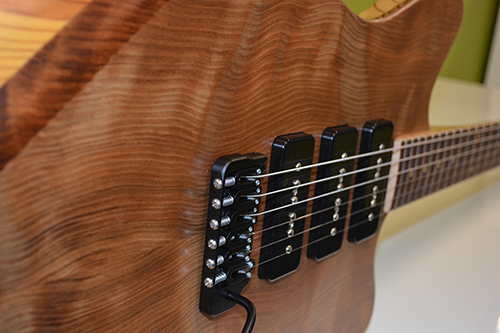 Regardless of model or configuration, your custom StoryWood guitar had a former life. Our mission is to find high-quality, rare sources of reclaimed wood that make outstanding guitars and tell an interesting story. Age can do wonderful things to wood in the right circumstances, and our guitars have a liveliness and resonance that comes with vintage wood. We’ve made our custom guitars from wood reclaimed from American Tobacco Company warehouses, the Harriet & Henderson cotton mill and the Vaughan Furniture Company factory. We make maple guitar necks from former factory flooring. Our fingerboards might come from logs that spent the last hundred years at the bottom of a lake in Panama or river in Belize, or from flooring that hosted thousands of games underfoot in a university gymnasium. And we'll share your new guitar's stories with you. Old-growth, and even second-growth, wood has qualities unlike what we see in freshly harvested wood today. 100+ year old heart pine may as well be a different wood type as compared to pine 2x4s from the big box store. 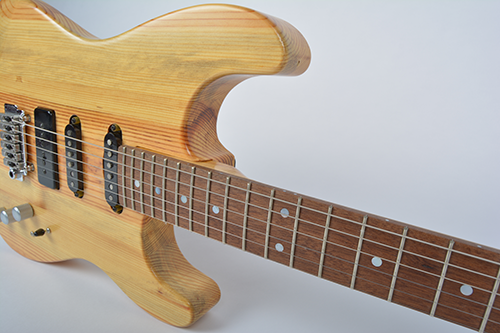 We have five custom guitar and custom bass guitar models designed to show off the colors and tight growth rings that are common in reclaimed wood. In our instruments, you may see the occasional nail hole or mineral streak. We've left them intentionally to help tell the story of its past and to be as efficient as possible with the vintage materials we use. Our guitars are based around standard configurations, but as you can see, that's just a starting point. Choose from a variety of reclaimed woods and hardware/pickup configurations to create your unique StoryWood custom guitar. There are literally hundreds of small custom guitar shops across the world that will give you a perfect replica of, or at least their take on, a ‘51 Nocaster, a ‘62 strat or a ‘59 Les Paul. At StoryWood, we’re doing something completely different. If you want a unique design, configured the way you want, made from vintage, reclaimed or salvaged wood that has a history and a past life to it, we’re here for you. StoryWood guitars are built using a standard model as the basis of design, but there are still many options available and choices to make. We want the process to be fun - as it should be. We're guitar lovers too and enjoy talking to folks that want something that nobody else has. We recommend a brief, no-pressure chat where we get to know you and what you really want in a guitar. In a short time, we'll have your guitar specs nailed down and be ready to start writing your story!